It’s surprising that it didn’t drive him mad. Everyday for months on end German Psychologist Hermann Ebbinghaus would memorize and recite long lists of meaningless syllables. What ever the tedium of these exercises, it was worth trouble. For with his experiments, conducted in the 1880s Ebbinghaus, forged the modern science of memory. 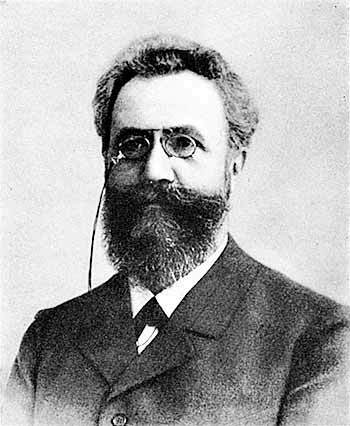 Ebbinghaus was the first psychologist to perform rigorous memory experiments. After receiving his Ph.D. in 1873 Ebbinghaus spent two years teaching in England, where he came in contact with the associational psychology promoted by British philosophers. Also, while in England he came across a copy of the Elements of Psychophysics by Gustav Fechner, an early advocate of experimental psychology. The great philosopher Immanuel Kant claimed that it was impossible to measure psychological processes. Fechner’s work was a direct assault on this pessimistic view. He was able to find law like relationships in the way people responded to stimuli. Ebbinghaus was deeply impressed with Fechner’s arguments and felt that he might be able move the study of learning from philosophical speculation to verifiable research. He used himself as a subject and many of his early conclusions have been supported by subsequent research. Ebbinghaus noted that the study of memory presented a central difficulty. If memory is affected by the degree of association, how could you control for past associations? Previous exposure might contaminate experimental results. If asked to memorize a line of poetry, previous exposure, even unremembered exposure, might affect your current ability to commit the line to memory. To solve this problem Ebbinghaus hit upon the use of three letter nonsense syllables, often called trigrams. Each trigram consisted of two consonants separated by a vowel, such as MIB or LAJ. In a typical experiment, Ebbinghaus would create a deck of thirteen cards with a single trigram on each card. He placed a blank card on the top of the deck. On the first trial he would go through the deck turning over each card, trying to learn the cards in order. After the first trial the he would turn to the deck over and start again, but this time when he looked at the blank card on the top he would try to name the following card. He would then turn over the blank card and see if he was correct. Looking at the first trigram card he would try to guess the name of the second trigram card and so on through the deck. This is called the method of serial anticipation, because he had to recall, that is anticipate, the next card from looking at the card that preceded it. Even though Ebbinghaus was working with nonsense syllables the method of serial anticipation, essentially a type of list learning, did resemble many important memory tasks. For example, learning the alphabet, the correct spelling of a word, or the lines of a poem, requires us to recall information in a particular order where each item is a cue for the next one. When Ebbinghaus could work through the deck with out error twice he considered the deck learned and recorded the total time it had taken him to learn the deck. After a deck was learned he would wait some amount of time, sometimes minutes, sometimes days, and test himself again. Typically he would make some mistakes and he would work through the deck a number of times to in order to relearn it. As with initial learning he considered the deck relearned if he could he could work through it twice without error. Not surprisingly it took less time to relearn the deck. The amount of time it took to learn the deck minus the time it took to relearn he called the “savings,” a measure of how much work had been saved in relearning the deck over initial learning. Dividing the savings by the amount of time it first took to learn the deck allowed him to represent the information saved in memory as a decimal fraction. By repeating this experiment many times with many different list over many different time intervals, Ebbinghaus made several important discoveries that bear on our goal of memory improvement. 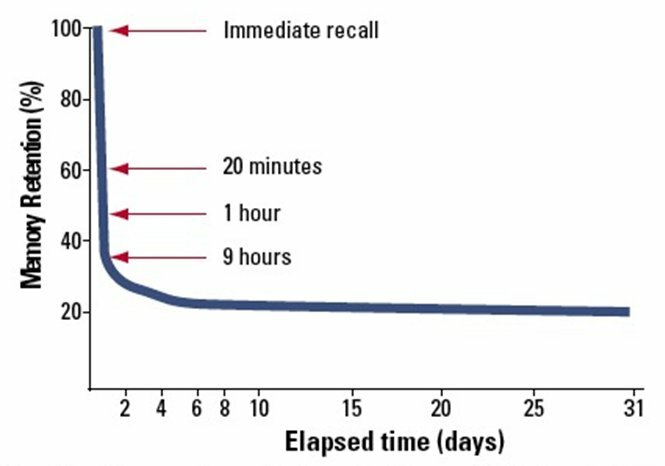 Perhaps the most important was a pattern that emerged over his many experiments, a relationship between initial learning, time, and forgetting that we have come to call the forgetting curve. The forgetting curve is essentially the opposite of the learning curve; the downward slope of the curve shows us how much information is lost over time. Studying this curve will lead us to understand those factors that increase resistance to forgetting.